Until November 5, Tanah Abang Skybridge construction in Central Jakarta has reached 92 percent.
" Tanah Abang construction now reaches 92 percent or entering finishing phase"
"Tanah Abang construction now reaches 92 percent or entering finishing phase where we will paint and install accessories to it," informed Yoory C. Pinontoan, PD. Pembangunan Sarana Jaya President Director, Tuesday (11/6). He explained, Tanah Abang Skybridge will be integrated with Tanah Abang Market Block G and Block F which are managed by Perumda Pasar Jaya. Besides it will be also integrated with Transjakarta bus shelter and Tanah Abang Station which is under management of PT. Kereta Api Indonesia (PT. KAI) and PT. Kereta Commuter Indonesia (KCI). 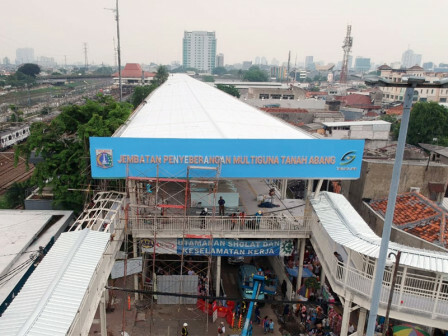 "We hope Tanah Abang Skybridge construction can create a new face for Tanah Abang primary center as the biggest trade center in Southeast Asia," he expresse d.